Hi everyone, so last week I was finally able to purchase my google developer license. This is what let’s someone actually publish a game and add all those cool extra features like online leader boards, achievements, and cloud saves. So far I have a working leader board for Knight Guy’s Arcade Mode, and I am working diligently to write the code necessary to track game play stats for achievements. 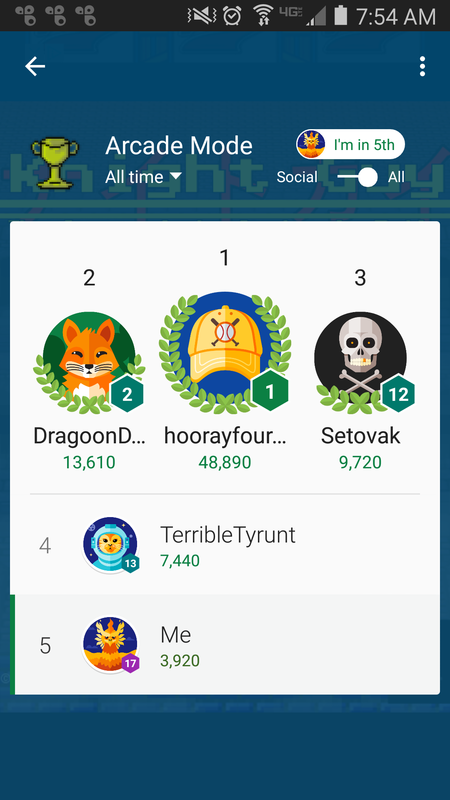 I took a screen shot of the current leader board from the test group… Yes that’s me in last, I guess I’m better at making games, than playing them.